Please, bare with me wile I work on putting this website together. My old one's web provider is closeing down, so I am haveing to make a compleatly new one now. I finally got the Mini Rex pages all done. Will start on the Harlequin pages next, and will work on them when I have time. If you have any questions, or need anything, feel free to email me! Thanks! Hello, my name is Ashlee Hawkes. I raise and show Mini Rex Rabbits in - Tort, Sable Point, Red, Black, Blue, Chocolate, Lilac, Otter, Castor, Brokens and REWs, and Harlequin Rabbits in all 4 colors of Magpie and Japanese. I also have a few mixed breed meat type does for meat rabbit babies as well, and plan on getting some Pure Bred meat breed rabbits in the future! I also raise Guinea Pigs, Boer cross goats, and Chickens as well. I am located in Rosepine, La. Back in the Spring of 2009, I had went to Tractor Supply Co., and saw this beautiful little dark colored rabbit with the softest fur! I had to go home and tell my parents, and begged to get it! Well, we had went back to the store, and he was still there - must have been ment to be! LOL! I bought him and brought him home. I knew he was a Mini Rex and was a buck, but I had no idea about colors or anything. About a month or so later, I found a young 4-H'er who was selling some Mini Rex babies, and I picked up a little Broken Castor doe from him. They both were so cute and so pretty! I loved them! My brother jokingly said he was going to make stew out of my buck, so the name just stuck, and I called him Stew! I named the doe Sugar, because she was so sweet. I showed them at my verry 1st show that Fall, at the Beauregard Parish Fair, and got Best in Show with the buck and Best Opposite in Show with the doe. I later on found out that my buck, Stew wasn't even a showable color, as he was a Steeled Castor, but they didn't care for just a small, local fair show though, but Stew wasn't shown any more after that. In the Spring of 2010, I found a breeder, Mrs Ariana St. Pierre, of AA Rabbitry, who had pedigreed Mini Rex, and bought my 1st Pedigreed rabbits from them. 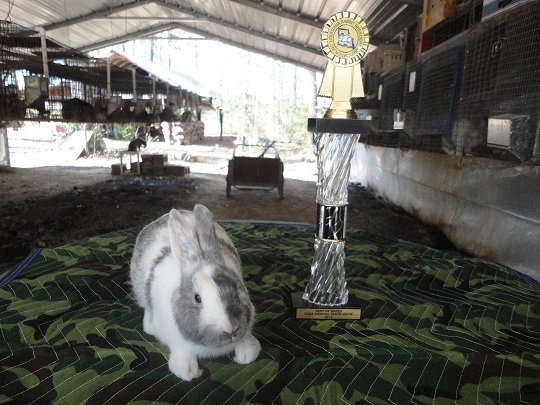 I also found out about the Louisiana Rabbit Breeder's Assocation, and started showing in their ARBA santioned shows across the state. Since then, my Mini Rex herd has grown greatly, with some wonderful rabbits, from several different great breeders! I also wanted to get another breed to show as well, so experaminted with several other breeds, trying to fingure out which I liked the best, to go along with raiseing the Mini Rex. I tried Dutch, Holland Lops, Netherland Dwarfs, Polish, New Zelands, and even Standard Rex. None of them just really seemed to interest me much, until I found the Harlequins! One of the Mini Rex breeders I had got some rabbits in Alabama, Mrs. Rebecca Blanks of Bronwyn's Bunnies, also raised the breed. She didn't have any for sale at the time, but she had a friend who did have some for sale, and she helped me get my verry 1st 2 Harlequins - 2 Blue Magpie sister's Brak's Hug and Brak's Kiss. I later was able to ad a buck from a breeder in Tennessee, and then get some more from Mrs. Rebecca, and also from another breeder friend in Texas, Mrs. Tiffany Parsley, of Parsley's Rabbitry. with my Harlequin bucks, for meat babies and babies to sell as breeding stock. I raise and sell Pedigreed Purbred Mini Rex and Harlequins for show, breeding, and pets. In Mini Rex, I raise - Tort, Sable Point, Red, Black, Blue, Chocolate, Lilac, Otter, Castor, Brokens and REWs. In Harlequins, I raise both Magpie and Japanese, and have all 4 colors in both varietes. I also have a small herd of mixed breed meat rabbits, and sometimes will have some breeding stock or fryers for sale. Check with me to see what I have available or to get on a waiting list. I use to raise and show purbred Boers, Nubians, and Alpines when I was in highschool, but since I graduated, I sold most of the show stock, and kept just a few of my favorites, that were basically just big pets. So, all I have now is just a small herd of Boer cross goats. I will have a few commercial kids to offer for sale after they are weaned. If you have any questions or are interested in any thing I have for sale, please email me, and I will get back with you ASAP!